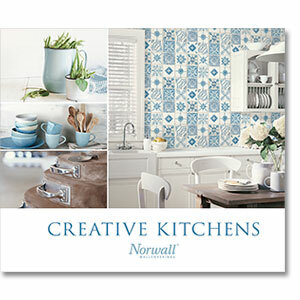 Creative Kitchens offers a collection of unique designs that will surely make your kitchen the heart of your home. Artwork ranges from watercolour cacti, collage-like teapots, Moroccan tile, wine crates, geometric diamond wood inlay, bistro style chalkboard with coordinating small prints, plaids, stone and more. Colours range from neutral to blues, yellows, greens and more. Whether your kitchen is a place where you showcase your culinary talents, relax in, or use for entertaining, these featured designs will add a fascinating feel to your cherished personal space.